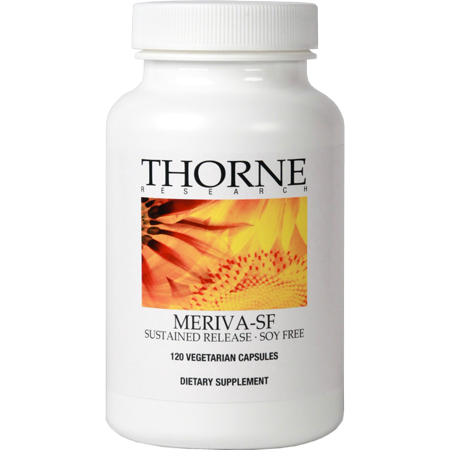 Meriva-SR is a unique, patented, time-release curcumin product. People throughout Asia have benefited from the healthful effects of curcumin for centuries. Curcumin is the orange pigment in turmeric (the primary ingredient in curry), and is a potent antioxidant that offers numerous health benefits, including supporting joint health and cardiovascular function, and helping to maintain the body's normal inflammatory response. A 2007 study published in the journal, Cancer Chemotherapy and Pharmacology, demonstrated Meriva's superior bioavailability compared to ordinary curcumin. Liver levels of curcumin were also higher with Meriva supplementation. A human study demonstrated 29-times greater bioavailability. In both studies, Meriva supplementation resulted in higher plasma concentrations of curcumin from a much smaller dose than with ordinary curcumin. Several studies have illustrated curcumin's hepatoprotective effects, leading researchers to suggest its use in protecting the liver from exogenous insults from environmental toxins. Curcumin also has the capacity to increase both the flow and solubility of bile. Curcumin's hepatoprotective effects are due in part to direct free-radical scavenging; but curcumin also enhances the body's natural antioxidant system, which increases glutathione levels, thereby aiding in hepatic detoxification and inhibiting nitrosamine formation. Other Ingredients:High and low viscosity hydroxypropyl methylcellulose and CalciumCitrateLaurate, Hypromellose (derived from cellulose) capsule, Leucine, Silicon Dioxide, Microcrystalline Cellulose.